$26.223 million on 3651 screens. On the surface, Disney’s 2008 release Bolt looks like a success. After all, it pulled in a decent $114 million at the box office, and it earned an Oscar nomination as Best Animated Feature. So why do I maintain the feeling that the movie received a pretty meh reception? Maybe it’s just me, but there’s where my impression of Bolt remained. Nonetheless, I dig Disney animation, so I definitely wanted to give it a look. We meet a dog named Bolt (voiced by John Travolta). Adopted as a puppy by a young girl named Penny (Miley Cyrus), we learn that by the age of five, her father has engineered Bolt to be a super-canine action stud. Or maybe not. After a long sequence in which Bolt stops masses of baddies, we learn that he’s just an actor in a TV series. Everyone knows this – everyone except for Bolt himself, that is. He really believes he possesses superpowers and must protect Penny. This makes the girl uncomfortable, as she worries about Bolt’s happiness. Penny wants to treat Bolt like a real dog, but her agent (Greg Germann) and the folks behind the show prevent this. Matters take a big twist when Bolt escapes his trailer and accidentally gets shipped from LA to New York. When he emerges from the box, he continues his delusional quest to save Penny, and he ends up under the belief that a local cat named Mittens (Susie Essman) can lead him to her. Mittens goes along with the scheme and tells Bolt that he can find Penny in Hollywood. This sends Bolt on a trip across country to rescue his owner, one that includes Mittens as well as a hamster named Rhino (Mark Walton). While generally pretty formulaic, Bolt works where it counts: it entertains. Its most clever side comes from its “Truman Show times 10” concept. It radically stretches credulity to set up a world in which a dog thinks of himself as a true superhero - but then again, real dogs don’t talk, either. It’s best to just go with the flow and not question the many outlandish parts of the film. To my surprise, the action elements work pretty well. The opening sequence may be way over the top, but it still seems exciting, and the film builds to a climax that’s both dramatic and moving – especially if you’re a dog-lover. The bond between Bolt and Penny pulled the heartstrings of this canine aficionado, and I’m sure I’m not alone. In between the opening and ending, we find a whole lot of Standard Disney Fare. Bolt has to learn who he really is and change along the way, blah blah blah. There’s little that one could call creative in his character arc, but I don’t think that becomes a substantial problem. After all, plenty of Disney – and other – movies come saddled with obvious narratives; as long as those films give us something entertaining as they progress, I can live with their predictable nature. And Bolt does just well enough in that regard to keep us occupied. At no point does it threaten to become anything special, and parts of it plod a bit. The supporting characters never become quite as endearing as the filmmakers hope, though the various pigeons add some good humor to the piece. Sometimes the whole is greater than the sum of its parts, however, and that holds true for Bolt. It may seem like an accumulation of recycled bits and pieces, but the package entertains. Bolt appears in an aspect ratio of approximately 1.78:1 on this Blu-ray Disc. This became an excellent presentation. Sharpness looked good. No softness materialized, so the movie seemed concise and well-defined. I noticed no issues connected to shimmering or jagged edges, and no edge haloes marred the image. Of course, the computer-animated affair came without source flaws, so don’t worry about any specks, marks or other defects. Bolt featured a natural but broad palette that looked great. The movie’s colors seemed dynamic they offered strong vivacity and impact. Exceptions occurred in “Bolt’s universe”, which tended toward intentionally cliché teal and orange. Blacks were concise and dark, while shadows were smooth. Everything about the image looked terrific. As for the film’s DTS-HD MA 5.1 soundtrack, it provided a strong affair. With the movie’s many action scenes, the audio often got the chance to shine. The soundfield offered a broad and engaging piece of work with lots of unique elements all around the spectrum. Music presented solid stereo imaging, while effects created a strong impression. All five speakers boasted many different auditory bits that meshed together to create a lively and involving setting. This was especially true for the excellent opening sequence. The movie started with a big action piece, and the soundtrack really impressed. Expect great movement and excitement there. Audio quality always satisfied. Speech was natural and concise, without edginess of other issues. Music seemed full and rich, while effects featured solid delineation. Those elements appeared vivid and dynamic. Low-end was bold and tight throughout the movie. Bolt gave us a consistently terrific soundtrack. 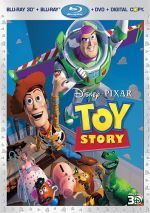 How did the Blu-ray compare to the original DVD? Audio was warmer and more dynamic, while visuals seemed tighter and more vibrant. The Blu-ray offered a superior rendition of the film. 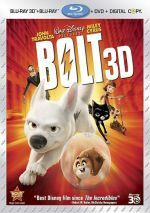 The package includes both 2D and 3D versions of Bolt. The technical comments address the 2D edition – what does the 3D platter bring to the table? In terms of quality, the 3D version wasn’t quite as crisp and vivid as the 2D image. The 3D edition seemed a little soft in some wide shots, and colors lacked the same punch. Still, the 3D display seemed very good in its own right. That version also came with nice 3D imaging. This seemed most pronounced during the action scenes that opened and closed the film – much of the rest of the film concentrated on depth. The 3D visuals brought a pleasing sense of dimensionality to the affair – they won’t wow you most of the time, but they gave the movie a little more flair. We start with two Deleted Scenes. These include “Dog Fight in Vegas” (2:28) and “River Sequence” (2:26). “Fight” offers an interesting alternate method for Bolt to learn that he doesn’t have superpowers, though it seems a bit too dark. “River” performs the same function; it’s more exciting, but I think the final film handles the issue better. We can view the scenes with or without introductions from directors Chris Williams and Byron Howard. They provide basic notes about the sequences and let us know why the pieces got changed for the end product. They throw out some useful info. Four featurettes follow. A New Breed of Directors: The Filmmakers’ Journey goes for four minutes, 34 seconds and features Williams, Howard, animators Joe Bowers, Steve Meyer, Marlon Nowe, KC Roeyer and Simon Christen, and executive producer John Lasseter. We learn a little about the directors’ efforts on the film and a few challenges they faced. While Howard and Williams include some nice observations, the piece’s brevity works against it; I would’ve preferred to hear them chat through a full commentary. For a look at the actors, we go to the nine-minute, 48-second Act, Speak! The Voices of Bolt. It includes remarks from Williams, Howard, Lasseter, character animator Amy Smeed, producer Clark Spencer, and actors Miley Cyrus, John Travolta, Susie Essman, James Lipton, and Mark Walton. We learn a bit about cast, characters and performances. I always enjoy these kinds of featurettes because it’s fun to see the actors at work. We get some good insights into this side of things in this fun program. Creating the World of Bolt runs six minutes, 45 seconds and includes notes from Spencer, Williams, Howard, Essman, art director Paul Felix, and director of look and lighting Adolph Lusinsky. “World” examines the film’s visual style. As with its siblings, the featurette seems shorter than I’d like, but it includes a number of useful details. Called In Session with John Travolta and Miley Cyrus goes for only 59 seconds. We hear from Williams, Howard, Cyrus, and Travolta. It acts as a very brief look at the Cyrus/Travolta-sung “I Thought I Lost You”. You can skip it and you won’t miss anything. Next we find a Music Video for “I Thought I Lost You”. It combines the recording studio shots excerpted in “Session” with movie clips. Both the song and the video are exceedingly ordinary. A new short titled Super Rhino fills four minutes, 27 seconds. In it, the movie’s hamster gets his own time to shine, as the cartoon turns him into a genetically-modified superhero. It’s all action and pretty entertaining. New to the Blu-ray, we get a collection of Art Galleries. These cover “Character Design” (66 images), “Color Script” (54), “Storyboard Art” (61) and “Visual Development” (64). Some interesting material appears in this nice compilation. 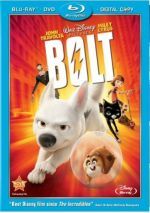 Another Blu-ray exclusive, Bolt’s Be-Awesome Mission offers a game in which Bolt must defeat the Green-Eyed Man. Like most Blu-ray games, it’s both too simple and too clunky to be fun. The 2D disc opens with ads for Lady and the Tramp, Brave, and Secret of the Wings. Sneak Peeks adds promos for Lion King 1.5, Beauty and the Beast: The Enchanted Christmas, Treasure Buddies, Cinderella, Planes and Prep and Landing: Naughty Vs. Nice. A third disc offers a DVD copy of Bolt. It duplicates the original DVD release. Although Bolt doesn’t compete with the best of Disney’s animated movies, it also never threatens to fall among their worst products. Sure, the film can be predictable and lacks great cleverness, but it keeps us entertained from start to finish. The Blu-ray boasts excellent picture and audio, but its extras seem mediocre. While the supplements disappoint, the disc does enough right to earn my recommendation, and I think the 3D adds to the presentation.